This bracelet is designed to be a smart and close health butler around you, which provides real-time monitoring to your personal health situation such as blood pressure, heart rate, sleeping quality and so on. You can access these information anytime and anywhere. IP67 waterproof performance allows you to swim and take a shower with it. 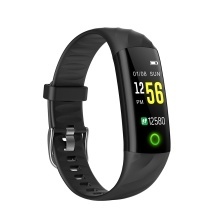 HEALTH MONITORING – Provides real-time monitoring to your real-time heart rate, blood pressure, sleeping quality and sporting calories, includes fatigue and sedentary reminder that reminds you to do some sports after sitting for a long time. MULTIFUNCTIONAL – Contains BT remote photo taking, messages and calls reminding functions. Besides, it also functions as a time-meter clock, which is so convenient to your life. TRACING – Support finding your phone when it&apos;s not around you. Just long press the button to choose the tracing function, your phone will ring when it&apos;s found. SMART – Automatically light up when you raise the wrist, convenient to check the time. Support GPS function when connected with your phone, tracing and recording your sport trail. LASTING & WATERPROOF – Quality battery works lasting for 4 days and standby for 15 days after being full charged, and it takes approximately 1.5 hours to be fully charged. Made by excellent technology that supports IP67 waterproof, which allows you to swim and take a shower with it.